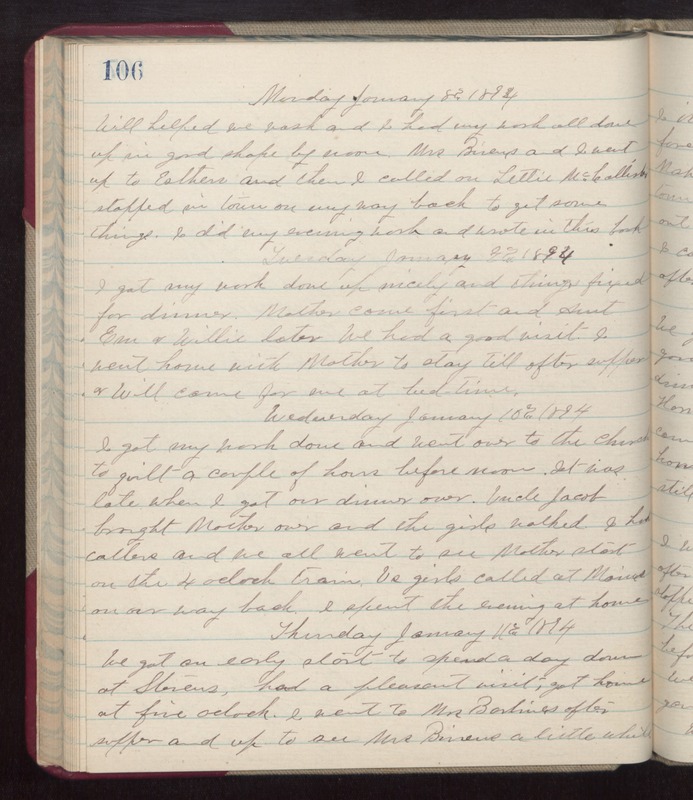 Monday January 8th 1894 Will helped me wash and I had my work all done up in good shape by noon. Mrs Bivens and I went up to Esthers and then I called on Littie McCallister. Stopped in town on my way back to get some things. I did my evening work and wrote in this book. Tuesday January 9th 1894 I got my work done up nicely and things fixed for dinner. Mother came first and Aunt Em & Willie later. We had a good visit. I went home with Mother to stay till after supper & Will came for me at bed-time. Wednesday January 10th 1893 I got my work done and went over to the church to quilt a couple of hours before noon. It was late when I got our dinner over. Uncle Jacob brought Mother over and the girls walked. I had callers and we all went to see Mother start on the 4 oclock train. Us girls called at Mains on our way back. I spent the evening at home. Thursday January 11th 1893 We got an early start to spend a day down at Stevens, had a pleasant visit, got home at five oclock. I went to Mrs Barlines after supper and up to see Mrs Bivens a little while.